1872 5c proof minor doubled die obverse. I finally decided to bring an example of this variety into my collection. It's an easy variety to find; in fact, a high percentage of 1872 proofs were struck with this doubled die (S2-1015, F-06, 3-O-III). You will sometimes see 1872 proof DDOs erroneously listed as FS-007. This example appeals to me because it's original, very clean, and a pleasing (to me, at least) golden tone with subtle shades of green. So, after passing over many opportunities, I finally pulled the trigger on this one. The fields are not deeply mirrored -- which is typical for Shield proofs -- but there is a bit of cameo contrast. This may not be the most expensive coin but I really liked the fact that it appears to retain it's original skin (if I'm not mistaken). BTW - That is a great looking coin IGWT. Really nice. Yes, Winstonware your CBH is a lovely example with attractive toning and orignal skin or patina. It's also one that does not cost an arm and a leg either. What if I have two recent acquisitions? Those two toners are awesome! I am surprised at the grade on the Morgan. The star is a no-brainer, but a MS64? The obverse looks like a 64, but the reverse is so clean – 66 maybe? I’ll admit I’m spreading some fairly new grading wings, but in my humble opinion with that clean a reverse it’s a solid 65. 1880-S Morgan: I like collecting Morgans and the minor VAMs. All too often, these errors remain unattributed and overlooked. This one was purchased from one of the board members. It's a common date, but it has nice luster and doubling on the date as well. I can't find it in the VAM Book, but I don't have all of the updates. 1885 Morgan: Here is another one that I won on eBay from another seller at about the same time. Note the die clash to the right of the bonnet from the wreath on the reverse. 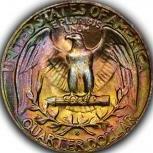 This "spike" from the eagle's wing on the reverse is quite common but overlooked. You guys have been busy. Great coins!! Are you out of your mind? ? It's got that RGBY gunk all over it!!! Well yes I am out of my mind and I don't think that's a big secret to anyone who has met me.......so what's your point ? The following three coins are on their way. This is the seller’s photo. I bid low on this Pilgrim for an album coin because I thought it looked dipped out. Turns out the image must have been in Gray Scale, coin in hand is lustrous. I love the 1810/09 overdate, MikeInFl. Always a deservedly popular variety. HA, ha - told you I was new at grading AND why I try to stay away from raw coins, for now. Man, it’s a beautiful coin. Of course, now there are even MORE beauties! I’ve been trying for about an hour now to take a photo of my coin, but alas all I seem to get is a reflection. I guess everyone’s second hobby is photography! Here’s one I picked up about a month ago. Both the obverse and reverse rims of the coin have a touch of bright rainbow toning. 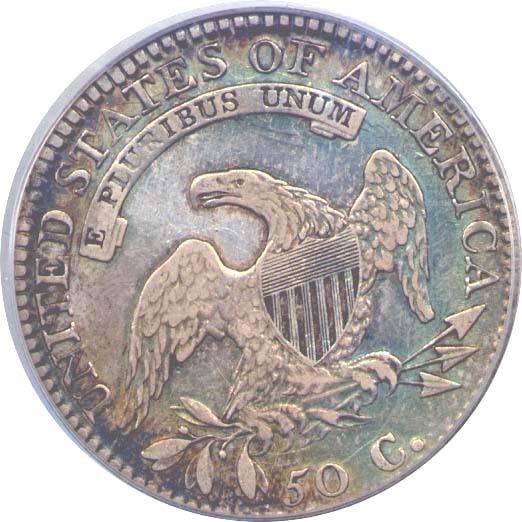 Although most prominent at 6 o’clock on the obverse, the color becomes more apparent in other areas around the rims as the coin in rotated under a light. In fact, most of the areas that appear dark in the photos actually show as color when light hits them at the correct angle. The centers are a very nice original silver color. Thanks to everyone for taking the time to post. These kinds of threads are a great prompt to do a little research on each coin posted; they present an opportunity to take me outside my areas of collecting. I really enjoyed this thread! All posts have contributed some outstanding coins! Unfortunately, I haven't added any NEWP's lately. I really enjoyed this thread too! All, very nice coins. 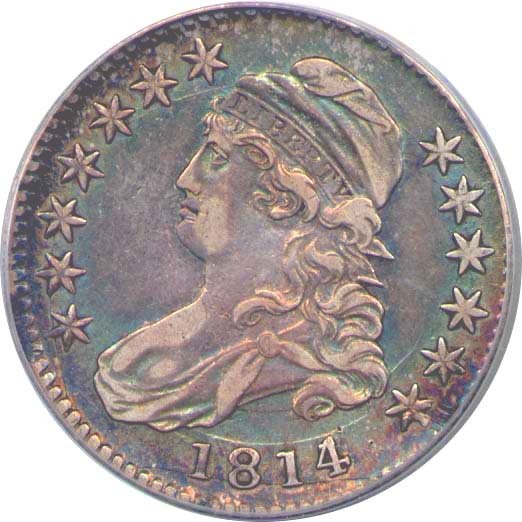 I hate to single any out because they are all outstanding but being partial to busts, that 1814 bust half is quite an eye catcher. I love it. And the 1810 penny is another of my favorites. I recently acquired an 1822 bust half from JJ Teaparty. A little overpriced, I think, but the coin is quite lovely. I usually am turned off some by mottled toning, though, not always. This coin though has it all, from my point of view, for an AU. The strike I think is great for the year, the center dot on the neck is quite pronounced, which I find kind of fascinating. It has very nice cartwheel luster, and though my photos don't show the color all that well, it has a steely grey color, maybe a hint on the greenish side, that, to me, is absolutely appealing. They had it labeled as an Overton 110, but it is not. I think it is an O-111, mostly because of the die rust under the right wing, but I'm not good at all with measuring dates etc so I cannot comment on the obverse at all. Should anyone agree or disagree with this attribution, please let me know, and why. It would be helpful. (I looked at the heritage pictures of the reverses of this Overton number, and they all have the die rust and lines from the crossbars going into the R wing (lines 2 and 3 to be exact, though Overton only says 'several' crossbars go into the R wing) and lines from the stripes going into the crossbars, all of which this coin has. Its enough to drive you crazy. Plate coins are sweet. Cover plates are sweeter still. Congratulations! Lou, for the life of me, I can't understand why anyone would want to serve or cover food on it. Whitman Publishing just released Rick Snow's book on Flying Eagle & Indian Cents. I believe that Boiler's '56 Flyer is the plate coin for the cover. That is pretty near numismatic sacriledge posting a modern Sac (albeit a nice die crack) after that magnificient '56 FE cent! 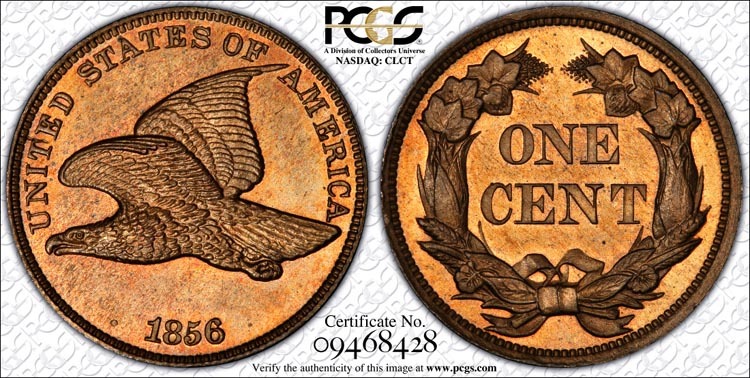 There are some seriously fantastic coins in this thread! Here is one I picked up at Baltimore.